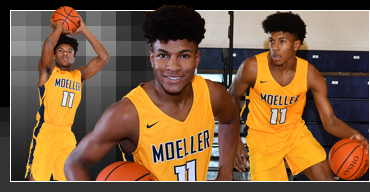 One of leaders in the Moeller Crusaders' magical Ohio state championship basketball run is senior guard Miles McBride. He is second in the GCL South in scoring, averaging 14 points per game, plus he is first in assists with 4.1 per game and first in steals with 2.2 per game He helped the Crusaders win a seventh straight league title and a second straight Ohio state title, the Crusaders' fifth state basketball title over all. The Crusaders went a remarkable 29-0 this season, becoming the first Greater Cincinnati big-school team to go undefeated since 1962. Moeller has won 49 straight basketball games dating back to December, 2017 and became the first-ever Cincinnati team to win back-to-back Ohio state titles since the creation of Ohio Division I classification. Miles recorded numerous all-around superb performances this season, including games vs. St. Vincent-St. Mary (20 points, five rebounds, six assists), Champagnat, Florida (20 points, six rebounds, 3 assists) and La Salle (20 points, 10 rebounds, four assists). His senior year honors so far have included being named GCL South Player of the Year, GCL South Defensive Player of the Year, 1st team all-conference for the 2nd time, 1st team SWO District and 1st team all-Ohio. Miles has basketball bloodlines. He is the son of former Summit Country Day and Xavier University basketball player Walt McBride. His older brother Trey also played basketball at Moeller and currently plays for Northwood University in Michigan. A good student who is active in community service, Miles will play basketball collegiately at the University of West Virginia. His favorite athlete is Donovan McNabb, favorite entertainer is Will Smith, favorite book is Percy Jackson The Lightning Thief and most-like-to-meet is Kobe Bryant. COACH'S QUOTE – "The important thing to understand regarding Miles McBride is that he is a winner. Miles is the rare player who dominates every game he plays and doesn't have to score. He is the epitome of a complete player!"